Lush Fab Glam Inspired Lifestyle For The Modern Woman: 5 Stylish Ways To Give Your Bedroom A Spring Makeover. 5 Stylish Ways To Give Your Bedroom A Spring Makeover. With summer quickly approaching, now is the time to store your winter bedding and upgrade your bedroom decor to match the spring/summer seasons with bright colors and fun designs. Simply changing your bedding to keep up with the seasons is an easy way to give your bedroom a fresh and updated look. 1. Beach Retreat: Rest peacefully on this beach inspired Trina Turk Trellis Turquoise 3 Piece Comforter Set. 2. Pretty Pastels: Go for a sweet and feminine makover with a beautiful and exotic pastel shade like the Trina Turk Trellis Coral Comforter Set. 3. Bright & Vibrant: Celebrate the arrival of the spring and summer seasons with the bright yellow sunflower fields inspired Trina Turk Ikat 3 Piece Comforter Set. 4. Colorful And Fun: Turn your bedroom into a fun multicolor and florals inpsired zone with Trina Turk's Geo Comforter Set. 5. Chic And Trendy: Incorporate one of spring's hottest fashion trends into your bedroom makeover with the Trina Turk Trellis Black & White 3 Piece Comforter Set. Get The Look: Love What You See? All featured bed sets are from Trina Turk's Bedding Collection and are available online at Zinc Door. Don't miss your chance to save on these and more stylish and trendy bed sets. 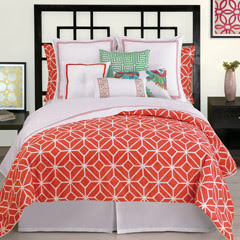 ﻿Enter code 15BED during checkout and get 15% off your Trina Turk Bedding! Which bedroom makeover will you try? Leave a comment below. Ι neeԁ tο to thank you for thіs wondeгful rеad! !